The overpass is tentatively scheduled to see the beginning of construction late this year. (FHWA), invites you to attend a public information meeting about the State Route 347 at Union Pacific Railroad project. The purpose of this meeting is to provide information and gather community input in advance of construction. ADOT, FHWA and the City of Maricopa completed a study to evaluate alternatives and identify improvements to access, capacity and traffic operations on SR 347 at the Union Pacific Railroad tracks through 2040. The study evaluated a future grade separation (bridge) to replace the existing at-grade intersection of SR 347 and the UPRR track. A total of 10 alternatives were considered for the project, with three of the 10 alternatives recommended for further evaluation. A public hearing was held on Dec. 3, 2014. Through an extensive evaluation process in compliance with the National Environmental Policy Act (NEPA), Alternative H was identified as the Selected Alternative. The Final Environmental Assessment (EA) and Finding of No Significant Impact (FONSI) were issued on March 18, 2015. Alternative H was refined in early 2016 to identify further improvements to access, capacity, and traffic operations. The revisions to Alternative H and the associated impacts to businesses and residences were presented in a public information meeting held July 14, 2016. The revisions to Alternative H initiated the need for an EA Re-evaluation that was completed Dec. 6, 2016. Final design has been ongoing and is scheduled to be completed summer 2017, with construction tentatively scheduled to begin in late 2017 and continue through late 2019. The project team will be available to answer individual and property-specific questions at the public information meeting. Maps and displays will also be available for viewing. The meeting is in the board room of the district office of Maricopa Unified School District. 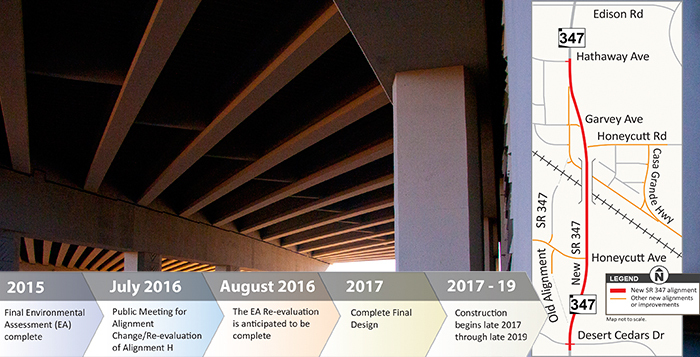 Prior to the public informational meeting, the project website at azdot.gov/347GS will be updated for your review. For additional information, or to submit comments in writing, please contact ADOT Community Relations Project Manager Julian Avila by calling 602-320-7263, or emailing Javila@azdot.gov, or visit azdot.gov/347GS. If you have questions or comments, email projects@azdot.gov or call the ADOT Project Hotline at 855-712-8530.